Whilst gold prices ended the week with a bullish signal and a deep hammer on the daily gold chart, for silver the trading session on Friday was less convincing, with spot silver ending the session lower and with a relatively deep lower wick. Whilst the lower wick suggests a mildly bullish tone for silver prices moving forwards, the high of the trading session seemed to find some resistance from the 9 day moving average which is a worrying signal, particularly as we failed to see any follow through from last weeks strong move higher in the middle of the week, and indeed most of this gain was promptly reversed the following day. With the 9 day moving average now having crossed firmly below the 14 day average, and with silver prices now sandwiched between this cross and the 40 day moving average, the technical picture for spot silver is far from clear, and whilst the gold price looks set to move higher, spot silver is more confusing. However, given the hammer candle of Monday last week, and the apparent bullish optimism indicated by the buying on Friday afternoon, I would tentatively suggest that spot silver should move higher in the short term, probably led by gold prices. For any degree of comfort we need to see a break and hold above the $17.50 per ounce price level, which seems some way off at present, and should we reach this level, we will then have the issue of the deep congestion area immediately above. 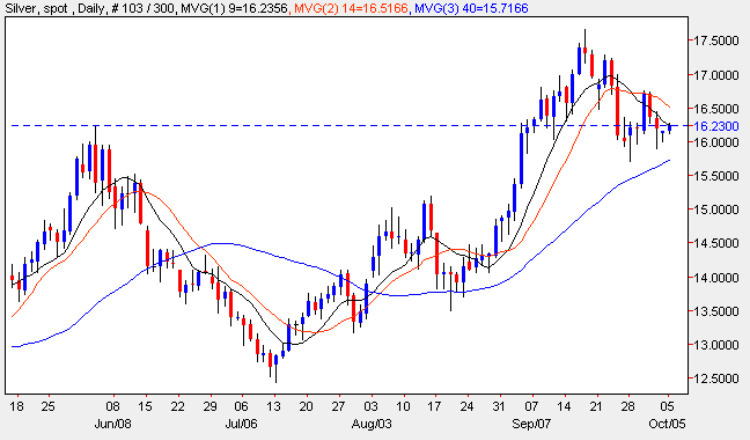 The short term outlook for spot silver price is sideways, the medium term is bullish and the long term is sideways.